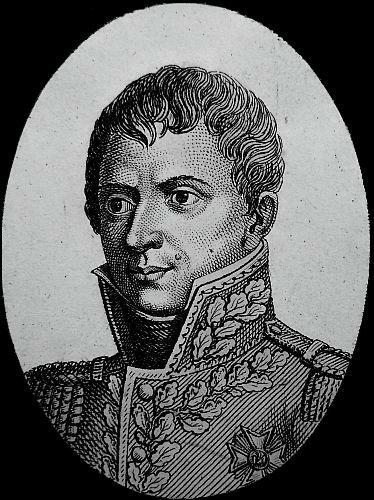 Napoleon sent Soult and Ney to Jena, and ordered the Imperial Guard to reinforce Lannes. The divisions of Suchet and Gazan were positioned on the heights overlooking the Prussians down on the plateau. 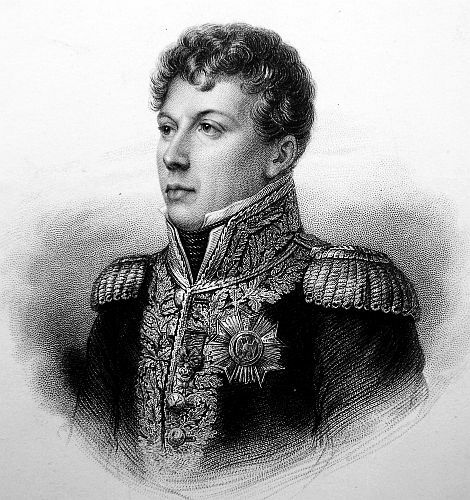 Lannes was short on troops and vulnerable if attacked until reinforcements arrived. 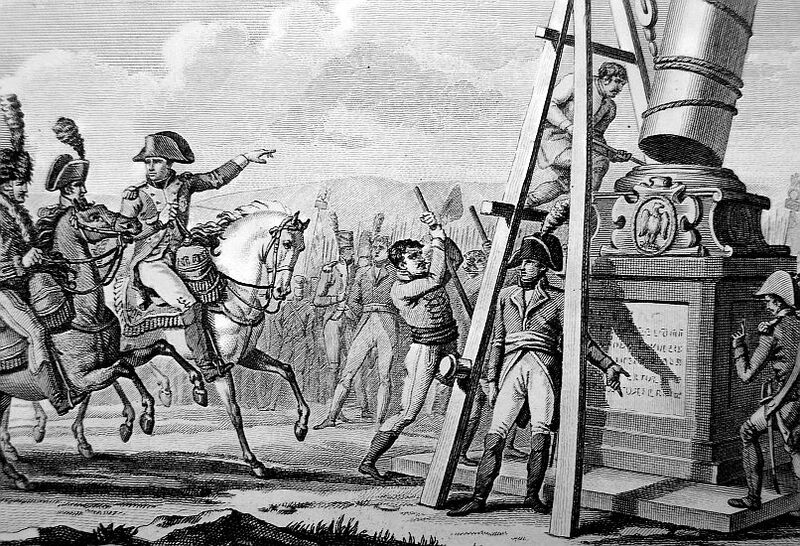 During the night Napoleon ordered the artillery to be pushed up and positioned on the heights, which was miserable work. After a lot of cursing the entire 5th Corps was huddled on it’s small perch before dawn. Lannes would lead the attack, and at six o’clock in the morning, he and the 5th Corps marched down the heights into a thick fog towards the Prussian army. Suchet led the way followed by Gazan. The fog made directing movements near impossible, and almost led to a friendly fire situation between the 5th and 7th Corps. The first task for Lannes was to take on the Prussians at Closwitz. Suchet won the action there and took possession of the town. Gazan was engaged at Clospeda and by ten o’clock in the morning, it fell to the French. 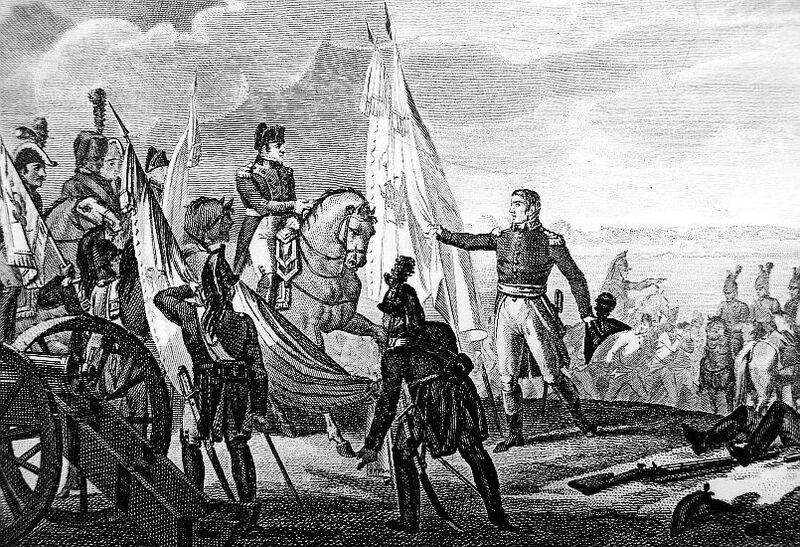 With the enemy cleared, Napoleon was in position to release his main army. The Impatient Ney broke ranks and headed towards the Prussians, but soon found himself pinned. 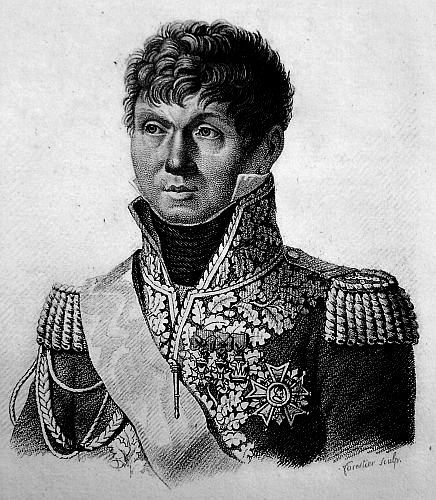 Napoleon ordered Lannes to assist Ney while the main army went on the attack. The Prussians were overmatched and Hohenlohe ordered a retreat. Lannes and Murat were not about to let them go without a fight so they chased down the Prussians and scattered them. When the affair ended Lannes was grazed by a musket shot. While the Prussians fled, an exhausted Lannes retreated to a local inn for some much needed rest. The locals who had just been invaded by thousands of French soldiers were obviously scared. One of these citizens was Johann Wolfgang von Goethe, who was afraid that the French would use his library of books to fuel their fires. Lannes posted some grenadiers to protect his writings from being destroyed. The two who were very different would become friends. It did not take long for Lannes to become impatient while waiting on orders to arrive. On the 16th of October he got them. He would march for Naumberg then to Dessau, where he would repair the bridge on the Elbe that had been destroyed. When the bridge was repaired he marched for Potzdam, and he arrived there on the 24th of October just outside Berlin. Soult marched into the open city of Berlin while Lannes headed to Spandau where a small Prussian force was fortified. The small force captitulated with little effort by the French. The Prussian army under Hohenlohe was still a threat, so Lannes was ordered to Stettin. The next few days were long and hard for the 5th Corps, with little sleep and rations. Hohenlohe was fortified at Prenzlau where he would make his final stand. He would surrender his command to Murat without a fight. One main reason for this surrender was the approach of the 5th Corps. Lannes was then ordered to occupy Stettin. When Lannes arrived he found the place well supplied with alcohol, and other items. The Prussians were completely decimated, but the Russians were in Poland waiting to strike. 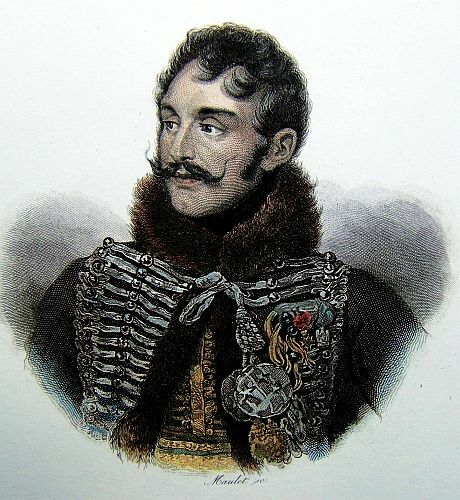 The campaign was still undecided and Lannes would soon march on Poland. A Courier dispatched from the head-quarters of the Army of the North, by Lieutenant-General VAN BEOCOP, Chief of the Staff of that Army to his Excellency the Minister of War, brought late last night the following details of the battle which took place the 14th of this month, between the French army commanded by his Majesty the EMPEROR and KING, and that of the Prussians commanded by his PRUSSIAN MAJESTY. Fought the 14th October, 1806. The battle which was fought yesterday, near Jena, will form an epoch in history. The Prussian army amounted to 150,000 men: they have lost 200 pieces of cannon, 30 standards, and 28,000 prisoners. The Duke of BRUNSWICK and General RUCHEL are both killed, and Prince HENRY of PRUSSIA dangerously wounded. A great number of Prussian Generals are likewise wounded. The loss of the French is much smaller: there are 1200 wounded in the hospital of Jena, and 1500 in that of Nauenbourg; and among the killed only one General, the General of Brigade DE BILLY, a soldier full of courage. The French cavalry is covered in glory. 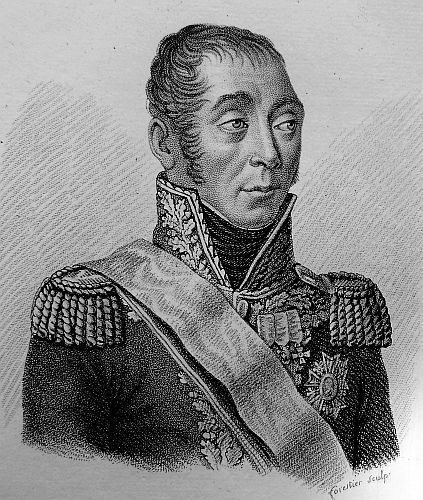 Marshal DAVOUST stopped the enemy at the defiles of Koesen, and before Nauenbourg; he fought the whole day, and routed more than 60,000 men, commanded by General MOLLENDORF, KALKREUTH, and the King of PRUSSIA in person. This division gained the highest glory. In short, all the troops contended with each other for bravery and courage. The divisions of Marshal LANNES, SOULT, NEY, and AUGEREAU, were all equally engaged, and equally acquired the greatest honour. The Queen of PRUSSIA, pursued by a squadron of hussars, fled on the side of Weimar. She left that place only three hours before our troops took possession of it. As she took flight in the direction where there are many of our troops, it is still very possible she may be taken prisoner. 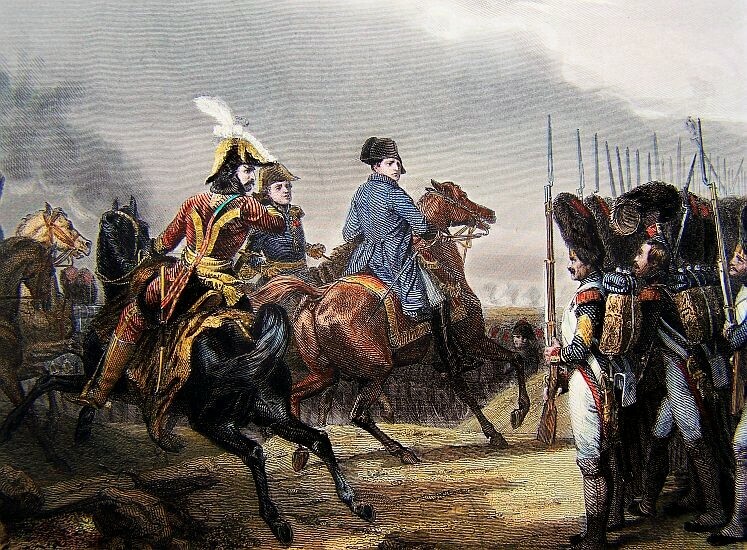 The divisions of the Cuirassiers and Dragoons could not arrive before the end of the day. They broke several square battalions of the Prussians, and made them prisoners. The Grand Duke of BERG was constantly at their head. Our troops arrived in the evening at Weimar, pursuing the rear-guard of the left wing of the enemy. Marshal DAVOUST pursued the right wing as far as Neustadt; he has this morning established his head-quarters at Likardsberg. 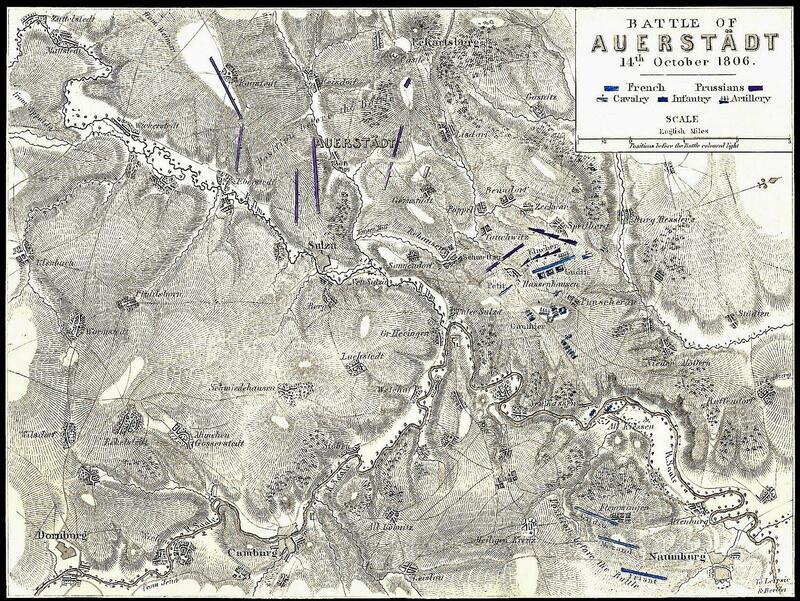 It is thought the enemy are trying to collect themselves on the side of Frankenhausen, in order to gain Magdeburgh. The loss of the enemy must have been enormous, we can hardly know it for some time to come: six of their Generals, and a great number of Colonels, are prisoners of war. Yesterday morning arrived here, by a courier from the army, the Fifth Bulletin of the Grand French Army, containing the particulars of the glorious victory gained over the Prussian army on the 14th. It is dated Jena, Oct 15, and is as follows:–The battle of Jena has wiped away the disgrace of the battle of Rosbach, and in seven days concluded a campaign which has wholly quieted all the dreadful preparations for war with which the Prussian heads were so much possessed. The following was the position of the army on the 13th: The Grand Duke of BERG and Marshal DAVOUST were with their corps of the army at Naumburg, having a part at Leipzig and Halle. The corps of Marshal Prince PONTE-CORVO was on the march to came up to Naumburg The Corps of Marshal LANNES advanced to Jena; the corps of Marshal AUGEREAU was placed in the position of Khala. The corps of Marshal NEY was at Rotha. The head-quarters were at Gera. 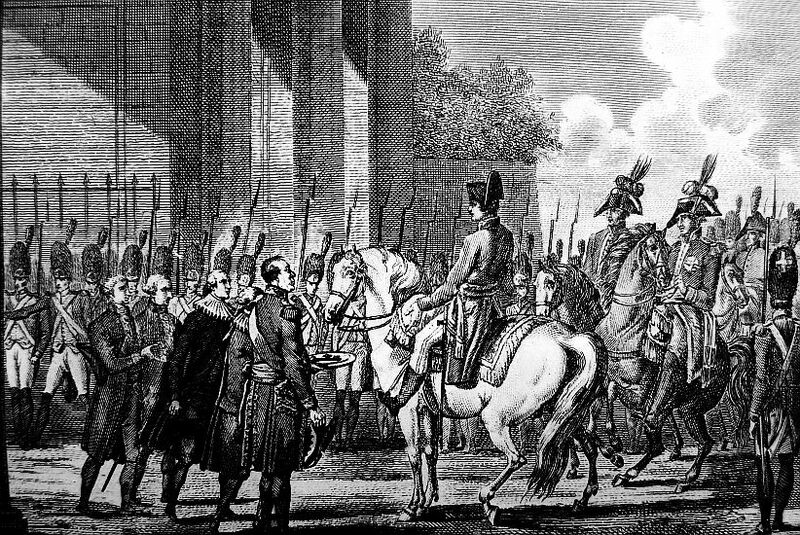 The EMPEROR was on the march to proceed to Jena. 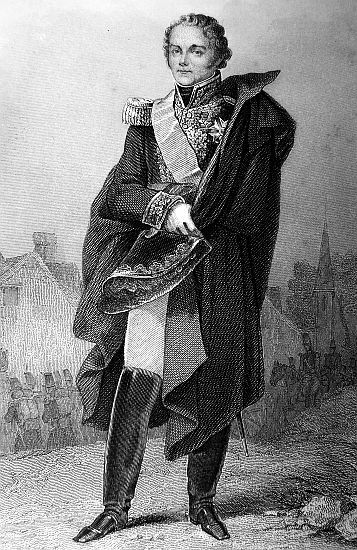 The corps of Marshal SOULT was on the march from Gera, to take a more convenient position upon the straight road from Naumburg to Jena. The position of the enemy was the following: The King of PRUSSIA wished to commence hostilities on the 9th of October, by bearing down his right wing on Frankfort, with his center on Wurtzburgh, and his left wing on Bamberg. All the divisions of his army were disposed for the accomplishment of this plan; but the French army turning him upon the extremity of his left wing, was found in a few days at Saalburg, at Lobenstein, at Schleitz, at Gera, and at Naumburgh. The Prussian army seeing itself turned, occupied the days of the 9th, 10th, 11th, and 12th, in calling in their detachments, and on the 13th formed itself into order of battle between Capelsdorf and Auerstadt, being about 150,000 men strong. On the 13th, at two o’clock in the afternoon, the EMPEROR came to Jena, and on a small elevated flat, beset by our advanced guard, reconnoitred the positions of the enemy, in order to manoeuvre in such a way as next day to force the different passes on the Saal, and so to fall on. The enemy made a vigorous opposition, and seemed by their dispositions, on an inaccessible position on the highway between Jena and Weimar, to think that the French could not stretch out upon the plain without previously forcing that passage. It did not appear possible, in fact, to bring the artillery upon the flat, which was so small, that four battalions could scarcely open out their ranks upon it. The men were set at work the whole night to make a way over the ruts, and at length succeeded in bringing the artillery upon the height. 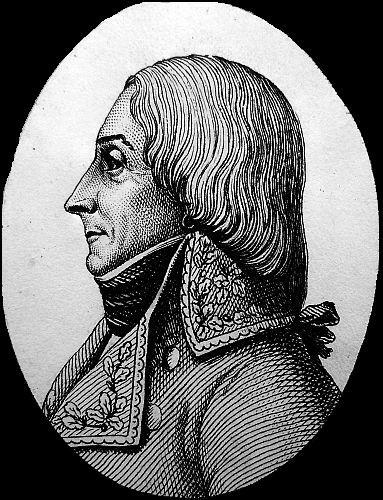 Marshal DAVOUST received orders to defile near Naumberg, for the purpose of defending the defiles of Koesen, as the enemy wanted to march upon Naumberg, in order to reach Apolda, and fall upon his rear in case he remained in the situation he then was. The corps of Marshal Prince PONTE-CORVO was destined to stretch out by Naumburg, in order to fall upon the rear guard of the enemy, in case he bent strongly toward Naumburg or Jena. The heavy cavalry, which had not yet come up with the army, could not be entirely brought on by mid-day. 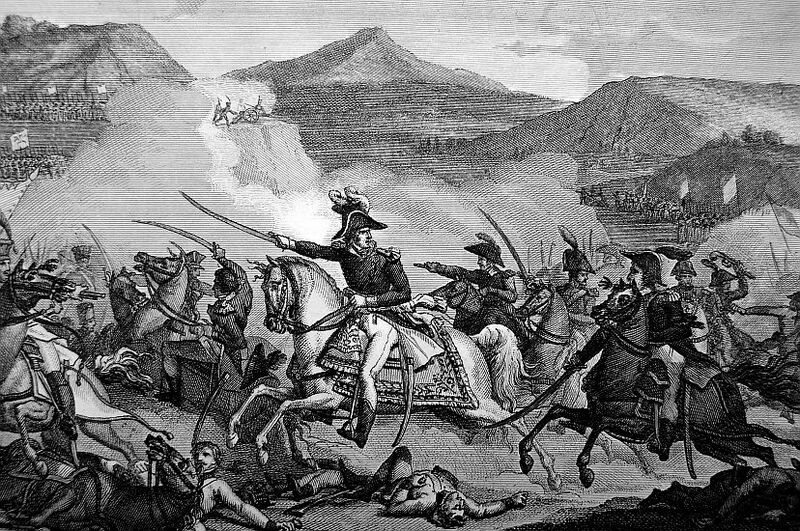 The cavalry of the Imperial Guard was at the distance of thirty six hours march, notwithstanding the heavy journey which it had performed since it left Paris; but it had come to that moment of the war, when no single consideration should outweigh to deprive them of the advantage of being the first to meet and fall upon the enemy. 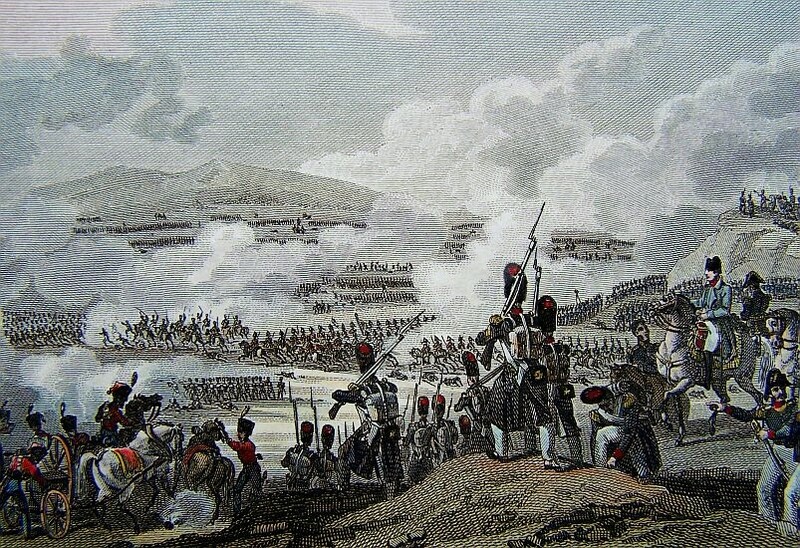 The EMPEROR placed the whole corps of Marshal LANNES in order of battle upon the level height, which the enemy seemed to overlook(they occupied a position over against it). This corps was placed under the care of General VICTOR; each division formed a wing. 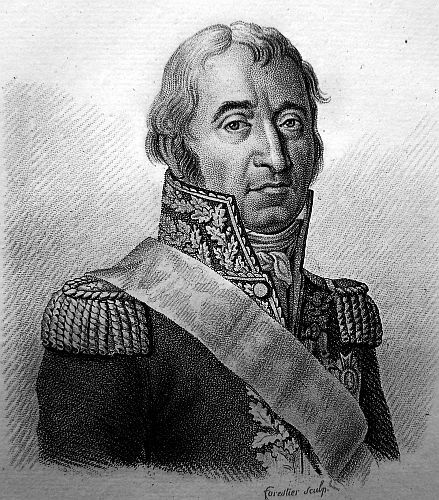 Marshal LEFEBVRE ordered the Imperial Guard into a square battalion upon the highest point. The EMPEROR kept the watch in the midst of his brave men. The night presented a remarkable spectacle: two armies, the one of which extended its front upon a line of six hours march, fired the air with its lights; the other, the lights of which seemed to be brought into one small point; and in the one, as well as in the other, all watchfulness and motion. The lights of the two armies were at half cannon shot distance respectively; the sentinels were almost touching; and there was not a single motion, on either side, which could not be heard from the other. The divisions of Marshals NEY and SOULT took up the whole night marching. At break of day the whole army was under arms. GAZAN’S division was disposed in three ranks; the left on the level height–SUCHET’S division formed the right–the Imperial Guards occupied the summit of a height. Each of these corps had their artillery in the little spaces between. From the town and neighbouring valleys the passes had been discovered by which the troops, which could not be placed upon the level height. A thick fog obscured the day. 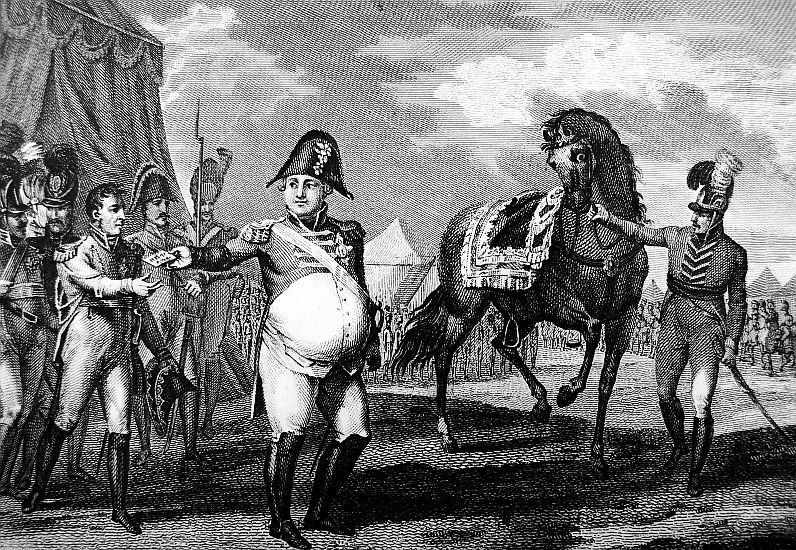 The EMPEROR passed before the different lines: he commanded his soldiers to take care of the Prussian cavalry, which had been described as being so formidable: he bade them remember that a year was not elapsed since Ulm was taken; that the Prussian army, like the Austrian then, was surrounded–head been driven from their line of operations, and lost their magazines; that they at the present moment no longer fought for honour, but for a retreat; that they alone sought to make themselves an opening upon different points; and that the corps of the army, which should let them pass, would lose its honour and its glory. To these inspiring words the soldiers answered, with a loud cry of ‘Let us onwards!’ The light troops began the action. They opened a very brisk fire. Good as was the position of the enemy, he was nevertheless driven out; and the French army marched out in the plain, and began to form in the order of battle. The enemy’s army, which on their side had no other view than to fall on whenever the fog should have cleared up, took up their arms. An army of 50,000 men from the left wing posted itself to cover the defiles of Naumburg, and to get possession of the passes of Koesen. But this was already anticipated by Marshal DAVOUST. 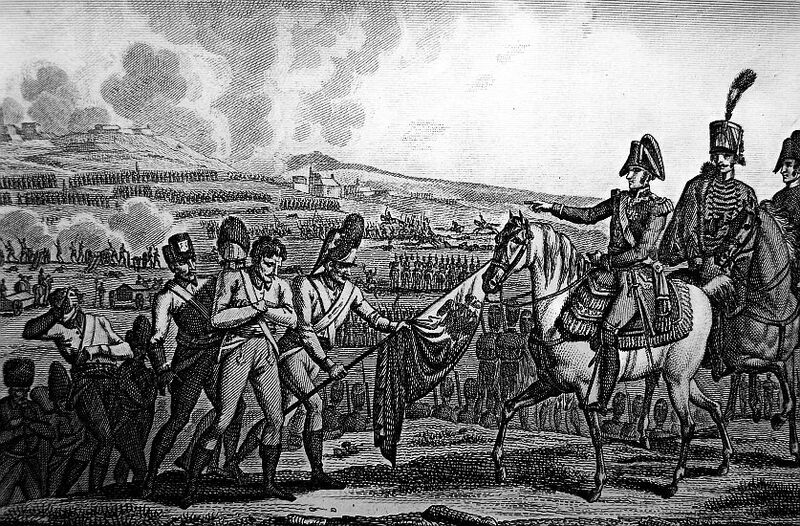 The two other armies, one amounting to 80,000 men strong, placed themselves before the French army, which was opening out from the level height of Jena. The mist hung over both armies, lasting two hours; but at length was dissipated by the brightness of the sun. The two armies mutually beheld each other at the distance of less than cannon shot. 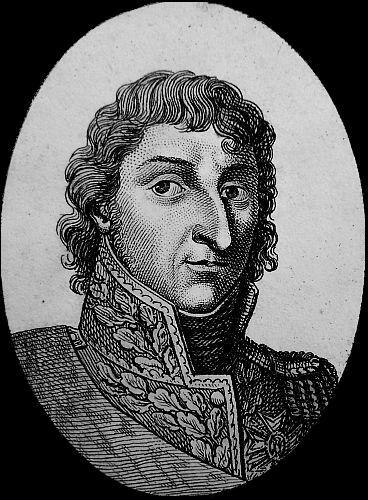 The left wing of the French army supporting itself against a village and the woods, was commanded by Marshal AUGEREAU. 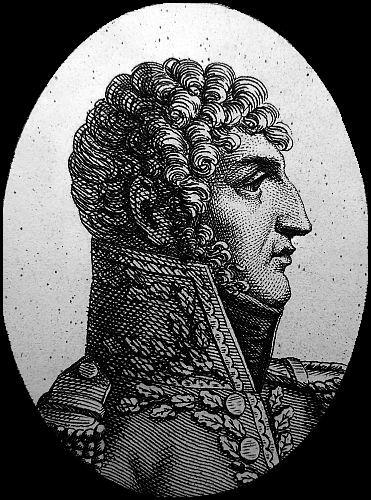 The Imperial Guard shewed their fire upon the centre, which was maintained by Marshal LANNES; the right wing was drawn together out of the corps of Marshal SOULT. Marshal SOULT had only a small corps of 3000 men, purely composed of troops which had arrived of his light corps. The enemy’s army was numerous, and displayed a fine cavalry; their manoeuvres were exactly and rapidly executed. The EMPEROR had chosen to delay coming to an engagement for two hours, in order to watch the positions which the enemy should take after the action of the morning, and to give the necessary orders to the troops, especially the cavalry, which required the greatest care. But the impetuosity of the French was too ardent for him. Several battalions had begun to engage in the village of Hollstedt. He saw that the enemy was in motion to drive them out; he gave immediate orders to Marshal LANNES to march with expedition to the support of the village. Marshal SOULT had attacked a wood on the right. 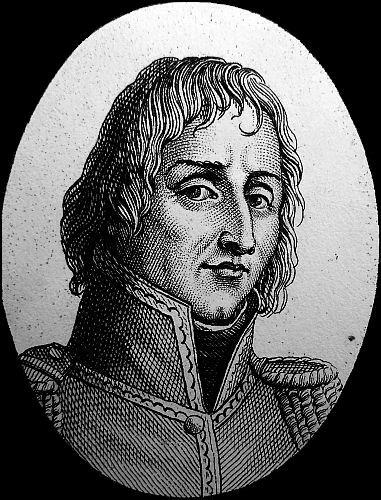 The enemy having made a movement with his right wing upon our left, Marshal AUGEREAU was commanded to repulse them, and in less than a hour the action was general. Two hundred and fifty, or three hundred thousand men, with seven or eight hundred pieces of artillery, scattered death in every direction, and exhibited one of the most awful events ever witnessed on the theatre of history. On one side, as well as on the other, every manoeuvre was performed as if it were on a parade. Among our troops there was not for a moment the least disorder; the victory was not uncertain for an instant. The EMPEROR had all along by him, besides his Imperial Guard, a large body of troops, as a reserve to act in unforeseen events. Marshal SOULT having got possession of the wood, which occupied him two hours, mad a movement in advance. 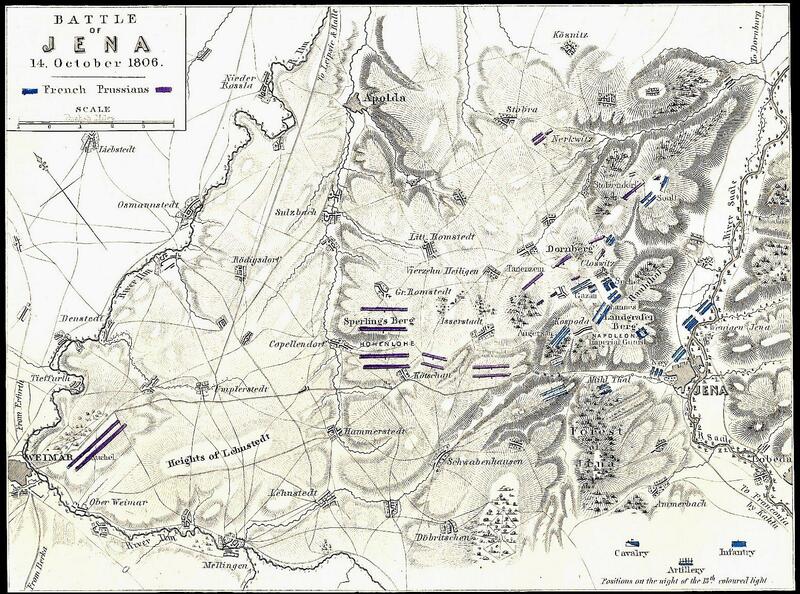 At that instant the EMPEROR gave orders that the division of French cavalry in reserve should begin to take post, and that the two new divisions from the army of Marshal NEY should take station upon the field of battle by the rear. All the troops of the reserve were advanced to the foremost line, which being thus strengthened, threw the enemy into disorder, and they instantly retired. They retrieved themselves during the last hour; but were cat into dreadful confusion, at the moment when our division of Dragoons and Cuirassiers having the Grand Duke of BERG at their head, were able to take a part in the engagement. These brave Cavaliers, fearing that the fate of the day would be determined without their assistance, bore the Prussians down before them in great confusion wherever they met them. The Prussian cavalry and infantry could not withstand the shock. In vain did they form themselves into a square; five of their battalions were put to the rout–artillery, cavalry, infantry, all were suprized and taken. The French came at the same instant to Weimar as the enemy, who found themselves pursued for six hours. 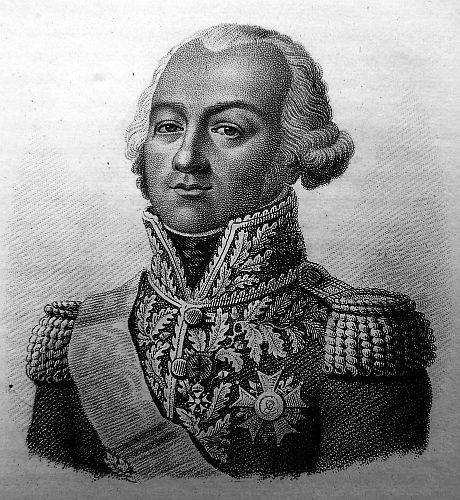 On our right wing, Marshal DAVOUST did wonders, Not only did he maintain his ground, but he followed fighting for the space of three hours against the great body of the enemy’s troops from the defiles of Koesen. This Officer to a distinguished bravery joins a vast deal of meanness, the first recommendation of a warrior. He was supported by Generals GUDIN, FRIANT, MORAND, DAULTNANNE, Chief of the Generals Staff, and by the steady intrepidity of his brave corps. The result of the battle is from 30 to 40,000 prisoners of war, and more are continually coming in; three hundred pieces of cannon, immense magazines and quantities of provisions. Among the prisoners are more than twenty Generals; among others several Lieutenant-Generals; one is Lieutenant-General SCHMETTAU. The amount of the loss of the Prussian army is enormous; it is estimated at above 20,000 killed and wounded. Marshal MOLLENDORFF is wounded; the Duke of BRUNSWICK and General RUCHEL are killed, and Prince HENRY of PRUSSIA is wounded desperately. According to the accounts of deserters, prisoners of war, and flags of truce, the disorder and confusion in the remainder of the enemy’s army is at the utmost. On our side, we have only to lament the loss of Brigadier-General DE BELLI, a brave soldier; and the wound of the Brigadier-General CONROUX. Among the killed are Colonels VERGES of the 12th Infantry of the line, LAMOTTE of the 36th, BARBENEGRE of the 9th regiment of Hussars, MARIGNY of the 28th Chasseurs, HARISPE of the 16th Light Infantry, DALEMBOURG of the 1st Dragoons, NICHOLAS of the 61st of the Line, VIALA of the 81st, and HIGONET of the 108th. The Hussars and Chasseurs displayed a valour on this day, which entitles them to the highest praise. The Prussian cavalry were never able to stand against them, and all the attacks they made upon the Infantry were fortunate. Of the French Infantry we shall say nothing. It is known long since that it is the best Infantry in the world. The EMPEROR declares, that the French Cavalry, after the experience of the last two campaigns and the last battle, has not its like. The Prussian army has, in this campaign lost every point of retreat in its line of operations. Its left wing, followed by Marshal DAVOUST, begins its retreat to Weimar, at the same time that its right wing and centre take their retreat from Weimar towards Naumburg. The confusion was therefore extraordinary. The KING was forced to retreat across the field at the head of his regiment of cavalry. Our loss is 1000 to 1100 men killed, and 3000 wounded. The Grand Duke of BERG is at this moment close up to Erfurt, where is a corps of the enemy commanded by Marshal MOLLENDORFF and the Prince of ORANGE. The General Staff is occupied in preparing an official relation, which shall make known with every detail all the different Corps and Regiments that have distinguished themselves; so entitle them to the esteem and acknowledgements of the nation; if any thing were wanting, they have testified it amply in the enthusiasm and love they have shewn for the EMPEROR in the thickest of the fight. At one moment there was room for a doubt; every mouth at once was filled with the universal cry of ‘Long live the Emperor!’ a sentiment which ran through every heart in the midst of the battle. The EMPEROR seeing his wings threatened by the cavalry, set forward a full gallop to the spot, to direct other manoeuvres, and order a change of front. He was every moment annoyed with the shouts of ‘Long live the EMPEROR!’ The Imperial Foot Guards, enraged not to be allowed to press on while they saw that every other corps was in motion, and that they were left inactive, several voices among them cried out ‘Forward!’–’What is this?’ said the EMPEROR: ‘This can come from none other but some beardless boy that will give orders independent of me: let him wait till he has commanded in thirty battles before he takes upon him to advise me.’ In the heaviest of the fire, when the enemy had lost almost all his Generals, it might be seen what Providence had done for us, which had spared our army. Not a man of distinction on the side of the French, is injured or wounded. 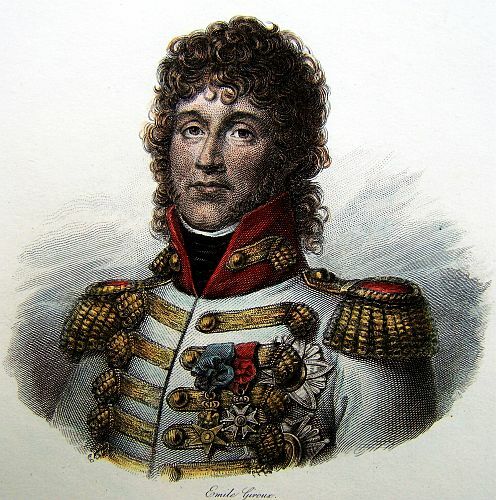 Marshal LANNES was grazed by a musket bullet on the breast, but escaped unhurt. Marshal DAVOUST had his hat and clothes shot through in several places with small bullets. The EMPEROR was continually surrounded, wherever he appeared, by the Prince of NEUFCHATEL, Marshal BESSIERES; the Grand Marshal of the Palace, DUROC; the Grand Master of the Horse, CAULAINCOURT; his Aides-de-Camp, and Equerr in Waiting. A part of the army did not fire a single shot. Erfurt is taken; the Prince of ORANGE-FULDA, Marshal MOLLENDORFF, several other Generals and a considerable number of the troops, are taken prisoners of war. The Lt. General , Chief of the General Staff of the Army. 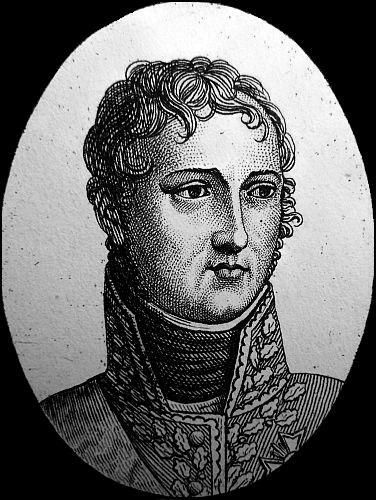 Marshal DAVOUST arrived on the 20th at Wittenberg, and took by surprise the bridge on the Elbe, just as the enemy were setting fire to it. Marshal LANNES is arrived at Dessau. The bridge was burnt. He set people to repair it immediately. 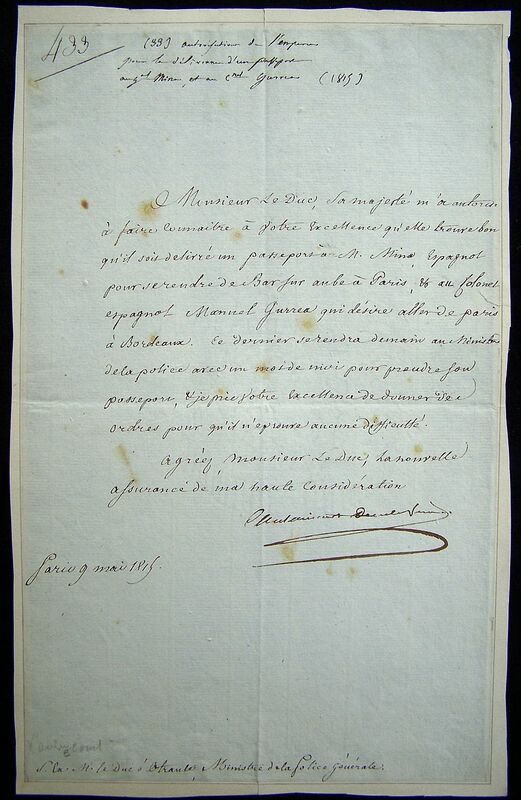 The Marquis LUCCHESINI appeared before the advanced posts, with a letter from the King of PRUSSIA. The EMPEROR sent the Grand Marshal of his Palace, DUROC, to confer with him. Magdeburgh is blockaded. 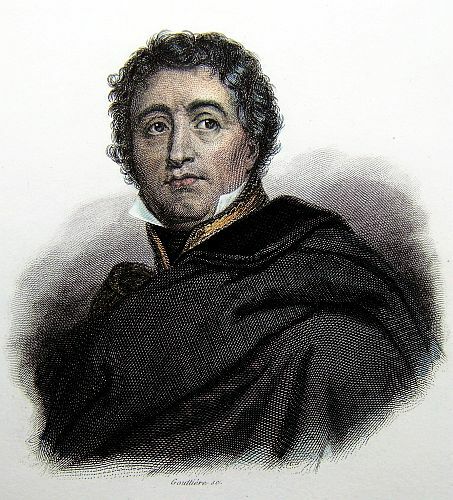 The General of Division LEGRAND, in his march to Magdeburgh, has made some prisoners. Marshal SOULT has his posts round the city. The Grand Duke of BERG has sent thither General BELLIARD, the Chief of his Staff. The General saw there the Prince of HOHENLOHE. The Language of the Prussian Officers was much changed. They loudly demand peace, ‘ What does your EMPEROR want?’ said they to us. ‘Will he pursue us continually, so closely? We have not had a moment’s repose since the battle.’ These Gentlemen were, doubtless, accustomed to the manoeuvres of the Seven Years War. They wanted to ask three days to bury their dead. ‘Thinking of the living,’ said the EMPEROR, ‘leave to us the care of burying the dead; there is no need of a truce for that.’ The confusion in Berlin is extreme. All the good Citizens who groaned under the false direction given to the politics of their country, reproach the fire brands kindled by England, with the sad effects of their intrigues. There is but one cry in all the country–against the QUEEN. The enemy appears to be endeavouring to rally behind the Oder. The Sovereign of SAXONY has thanked the EMPEROR for the generosity with which he has treated him, and who is about to match him from the Prussian influence. However, a great number of his soldiers have perished in all this squabble. 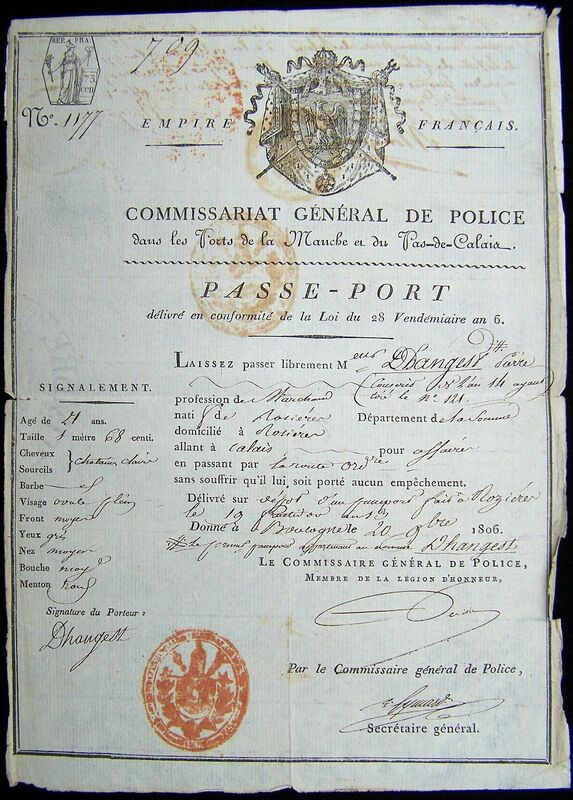 The Corps of Marshal LANNES arrived here on the 24th. Marshal DAVOUST’S corps entered Berlin on the 25th, at ten in the morning. The corps of the Marshal Prince of PONTE-CORVO is at Brandenburgh. Marshal AUGEREAU’S corps will enter Berlin tomorrow, the 26th. The EMPEROR arrived at Potzdam yesterday, and entered the Palace. In the afternoon he went to inspect the new Palace of San SOUCI, and the country in the environs of Potzdam: he found the situation and the building very pleasant. He staid some time in the Chamber of FREDERICK the GREAT, the hangings and furniture of which are the same now as at the time of his decease. Prince FERDINAND, the brother of the GREAT FREDERICK, remains at Berlin. There are 500 pieces of cannon in the arsenal of Berlin, several hundred weight of powder, and a great quantity of arms. General HULIN is nominated Governor of Berlin. General BERTRAND, the EMPEROR’S Aide-de-Camp, has been sent to Spandau. That fortress defends itself; he has invested it with the dragoons of DUPONT’S division. The Grand Duke of BERG is gone to Spandau, to follow a Prussian column which is marching from that place to Stettin, and which we are in hopes of cutting off. The Marshals LEFEBVRE and BESSIERES arrived at Potzdam at nine in the evening of the 24th. The Foot-guards marched fourteen hours in a day. The EMPEROR remained the whole day of the 25th, at Potzdam. 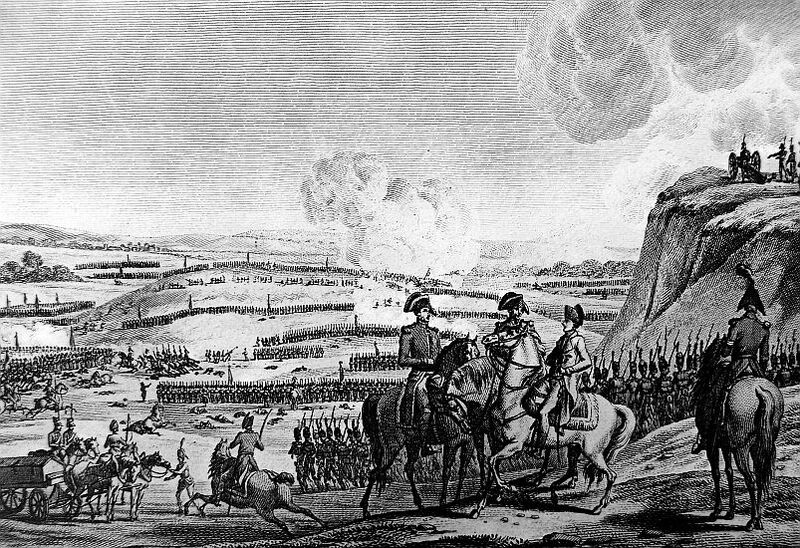 Marshal NEY’S corps blockades Magdeburg. Marshal SOULT’S corps passed the Elbe a day’s journey from Magdeburg, and followed the enemy to Stettin. The weather continues very encouraging. The present is the finest harvest ever seen. The EMPEROR, being on his way from Witenberg to Potzdam, was overtaken by a storm, and stepped into a house belonging to the GRAND HUNTSMAN of SAXONY. His MAJESTY was very much surprised to hear a fine woman mention his name. 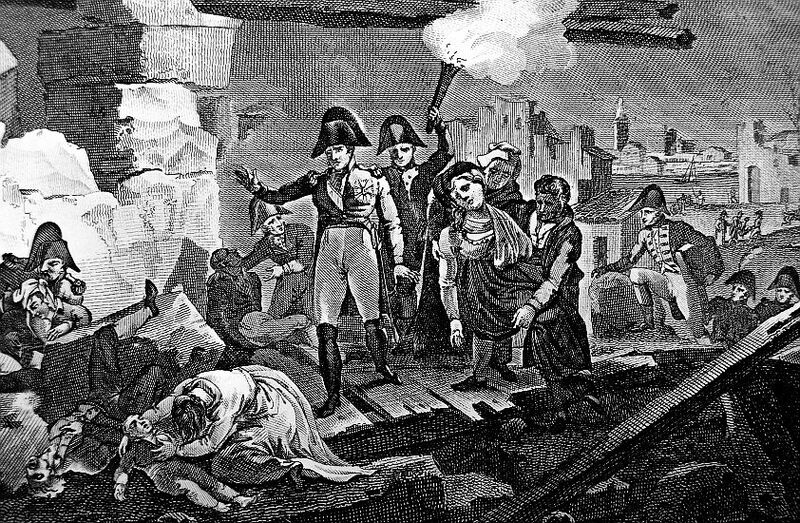 She was an Egyptian, the widow of a French Officer, who had belonged to the Army of Egypt. She had been but three months in Saxony. She lived with the GRAND HUNTSMAN, who had received and treated her honourably. 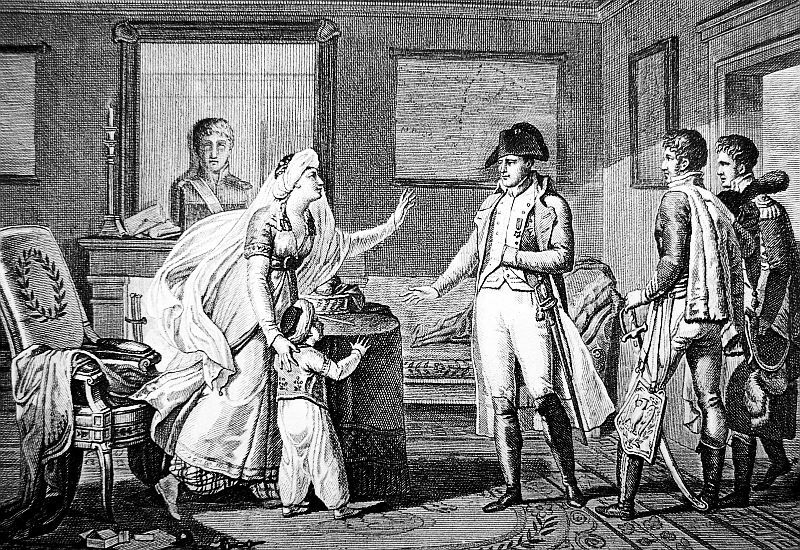 The EMPEROR ordered her a pension of 12 francs, and promised to take care of her child. 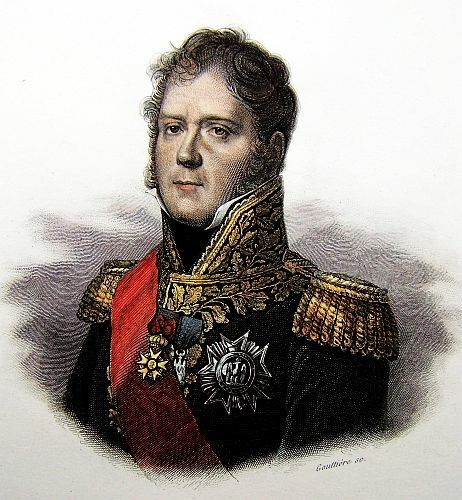 ‘This is (said the EMPEROR) the first time that I stopped to avoid a storm, and I had a presentiment that it would be attended by some good action.’ It was remarked as a singularity, that the Emperor NAPOLEON arrived at Potzdam, and entered into the same apartment on the same day, and almost at the same hour that the Emperor of RUSSIA did when upon his visit to Berlin last year; and which has been so fatal to Prussia. 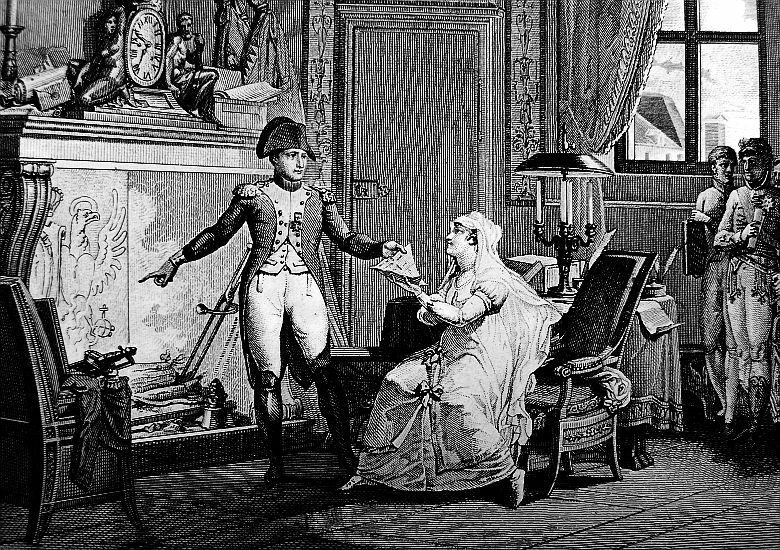 From that moment the QUEEN entirely quitted domestic affairs, and the serious occupations of the toilette, to meddle with those of the state, to influence the KING, and by these means to excite every where the same flame that animated her own bosom. The thinking part of the Prussian nation regard this visit as one of the greatest calamities that could have happened to Prussia. No idea can be formed of the activity of the faction to induce the KING to go to war in spite of himself. The result of the celebrated oath, taken upon the tomb of the GREAT FREDERICK, on the 4th of November, 1805, was the battle of Austerlitz, and the evacuation of Germany by the Prussian army, by forced marches. Forty eight hours after this event, a plate was engraved, and exposed in all the shops, and which excited even the ridicule of the peasants. Here was seen the Great Emperor of RUSSIA, near him the QUEEN, and on the other side, the KING, raising his hand over the tomb of the GREAT FREDERICK: the QUEEN herself, covered with a shawl, much in the same manner as the Londo engravers represent Lady HAMILTON, rests her hand on her heart, looking at the Emperor of RUSSIA. One cannot conceive how the Police of Berlin could suffer such pitiful satire to be disseminated. At any rate the shade of the GREAT FREDERICK could not but have been offended at such a scandalous scene. His mind, his genius, and his wishes were with the nation which he had so much esteemed, and of which he said, that if he was their King, a cannon shot should not be fired in Europe without his permission. It being All Saints day yesterday, there was no business at the Exchange; nor today, it being Sunday. The EMPEROR has reviewed the Imperial Foot-guards, consisting of ten battalions, and sixty pieces of cannon, served by the Riding Artillery. These troops, which have undergone so much fatigue, had the same appearances when they were at Paris. The General of Division, VICTOR, received a musket shot in the battle of Jena, and was obliges to keep his bed some days. 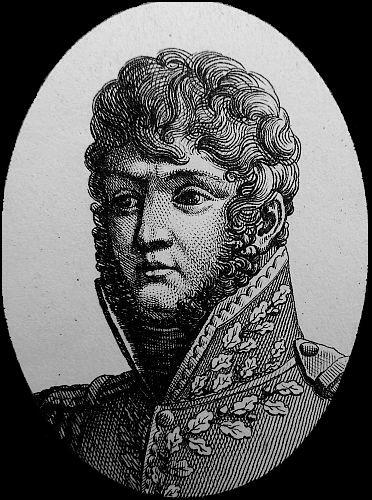 The General of Brigade, GARDANNE, Aide-de-Camp to the EMPEROR, had a horse killed and is slightly wounded. Some Officers of rank are wounded; others have had horses killed under them; but all of them were anxious to distinguish themselves by valour and courage. 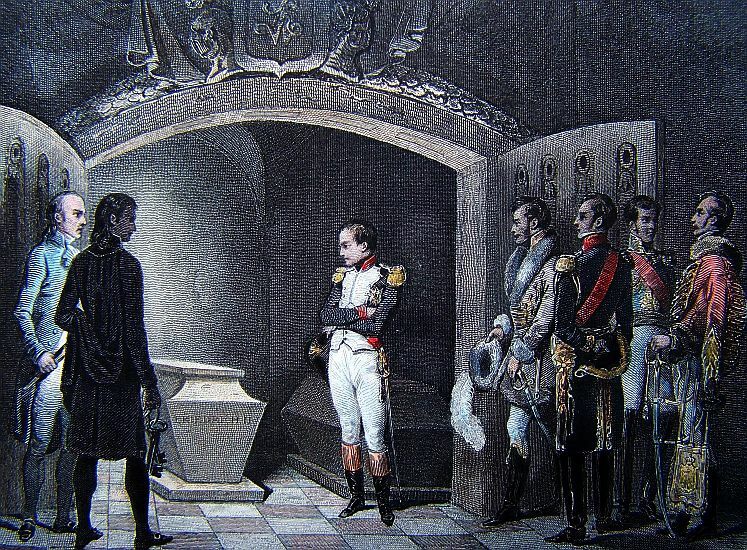 The EMPEROR has been to view the tomb of FREDERICK the GREAT. The remains of this great man are enclosed in a wooden coffin covered in copper. It is placed in a vault, without any ornaments, any trophies; without any distinction to recall the memory of his great and heroic actions. The EMPEROR has presented to the Hotel of the Invalids at Paris, the sword of the GREAT FREDERICK, the ribbon of his order, the Black Eagle, and also the colours which he took in the Seven Years War. 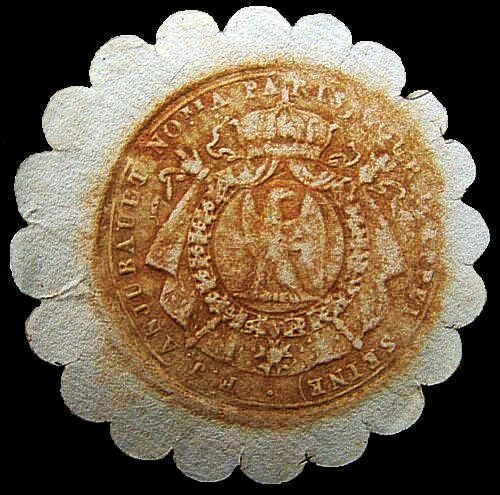 The old invalids of the Hanoverian army will receive every thing with a kind of religious veneration which belongs to one of the greatest Generals in the annals of history. Lord MORPETH, the English Envoy to the Prussian court, was only six hours distance from the field of battle, on the 14th. He heard the firing. A courier informed him that the battle was lost, and in a moment after he was surrounded by fugitives pouring in upon him on all sides. He ran away exclaiming, ‘I must not be taken.’ He offered 60 guineas for a horse: he obtained one and fled. The citadel of Spandau, three miles from Berlin, and four from Potzdam, strong by its situation, in the midst of water, having a garrison of 1,200 men and a great quantity of ammunition and provisions, was surrounded in the night of the 24th. General BERTRAND, the EMPEROR’S Aid-de-Camp, had previously reconnoitred the place. 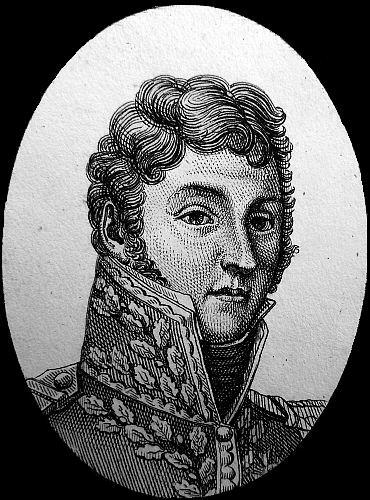 The cannon was ready to open upon it, and the garrison began to be alarmed, when Marshal LANNES proposed the capitulation subjoined to be signed by the Commandant. Large magazines of tents, cloathing, &c. have been found at Berlin; we are employed in taking inventories. A letter from Helmstadt, lately intercepted, contains some interesting particulars. The Prince of HATZFELD; BUSCHING, the Superintendent of the Police; the President KERCHIEFEN; FORMEY, a Privy Counselor; M.M. RUEK, SIEGREN, HERMENSDORF, Counselors, sent as Deputies by the City of Berlin, have this morning delivered the keys of the place to his MAJESTY at Potzdam. They are accompanied by M. GROOTE, Counselor of Finance and the Barons VICHNITZ and ECHARLSTEIN. They confessed that the reports spread through the city were false; that the citizens, and the mass of people, had viewed the war with regret; that a handful of women and young officers were the only persons who had promoted it; that he was a man of no penetration, who could not foresee what was to be expected from it. Like all the rest of the Prussians, they censured the visit of ALEXANDER as the cause of their misfortunes. The change which then took place in the mind of the Queen, who, from a timorous and modest female, engaged in her household affairs, became bewildered, wishing only for war; this change(they said) had produced a dreadful revolution. From that moment, she wished to have a regiment; she intruded herself into the Council, and took the lead in the monarchy to far, that in a few days she brought it to the brink of destruction. COPY OF THE CAPITULATION OF THE FORTRESS OF SPANDAU. Art. I. The Officers of the Garrison of Spandau, with their cloathing and effects, shall be at liberty to go where they please. Art. II. 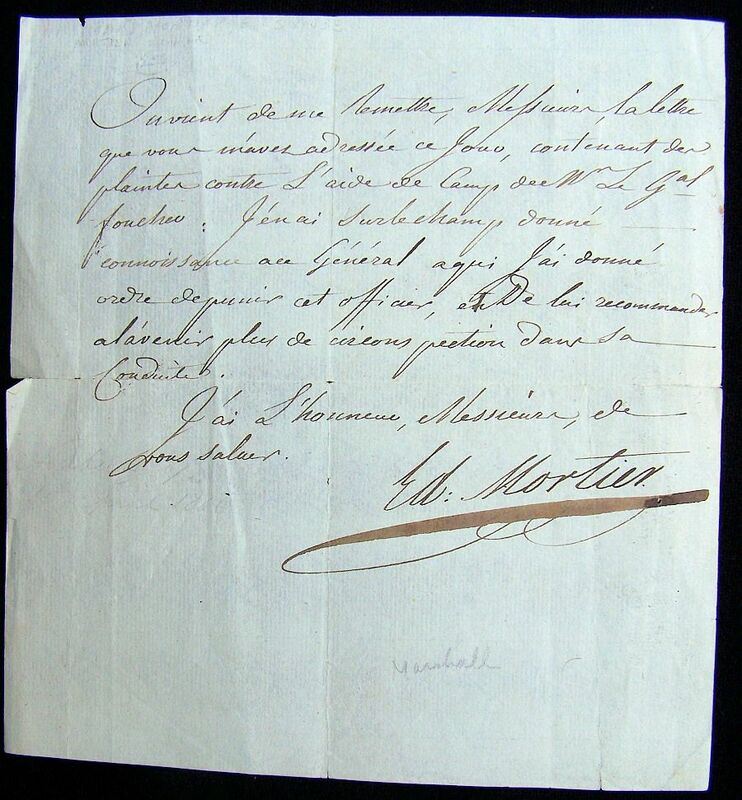 Marshal LANNES engages to request his MAJESTY the KING to permit the invalids and their wives to remain in the Citadel, and to leave them in possession of their effects. Art. III. The subalterns and soldiers, forming the Garrison of Spandau, are prisoners of war. Art. IV. The fortress, in its present state, shall be delivered up to the French army, with the arms, artillery, ammunition, and provisions. Art. 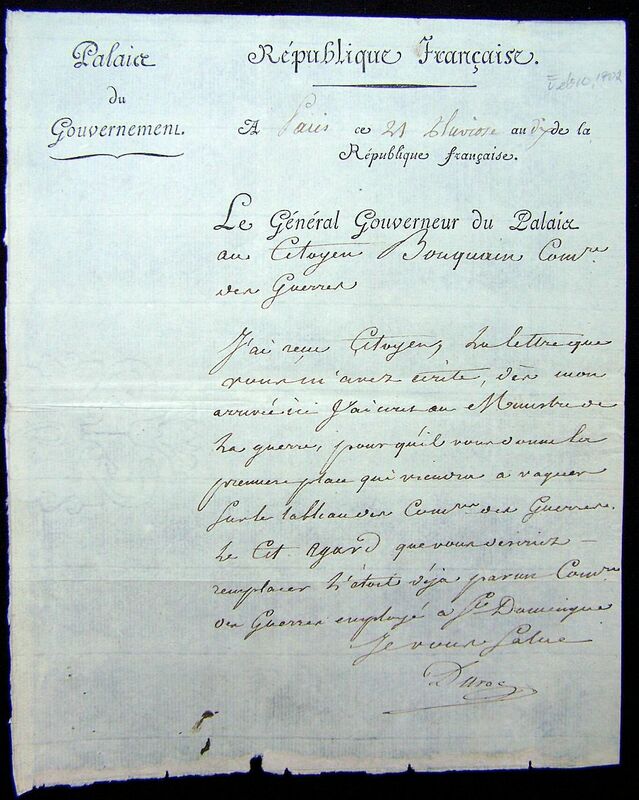 V. The Officers may withdraw to what place they chuse, Passports shall be delivered to them by the Chief of the Staff of the 5th Corps of the Grand Army. Art. VI. All persons not in the military service, shall leave the place, without entering into any conditions, and shall be permitted to take with them their cloathing, and other effects. The Emperor left Potzdam, at twelve o’clock, to inspect the fortress of Spandau. He has charged General CHASSELOUP, Commandant of the Engineers, with improving the fortifications of that place. This is a fine piece of work: the magazines are magnificent, and meal, oats, &c. have been found in them sufficient to serve the army for two months; besides ammunition sufficient to double the provision for the whole of the artillery. After the QUEEN withdrew from Potzdam, the portrait of the Emperor of RUSSIA was found, which she had received from the Monarch. At Charlottenburg was found the correspondence between the Emperor of RUSSIA and the KING for three years past, together with some Memorials written by English authors, to prove that nations were under no obligations to observe any Treaty made with the Emperor NAPOLEON, but that it was necessary for every power to range itself on the side of the Emperor of RUSSIA. These documents ought to form historical records: they shew, if it was necessary, how unfortunate Princes are when they suffer women to interfere in state affairs. The Notes, Reports, and State papers were scented with musk, and lay mingled together upon the QUEEN’S toilette. This PRINCESS had turned the heads of all the women in Berlin. But now another change succeeded. The first fugitives that took refuge there were received with contempt, and they were reminded of the day when they flourished their swords upon the plains of Berlin, they pretended to cut down all that opposed them. General SAVARY, sent off with a detachment of cavalry to seek the enemy, has informed us that Prince HOHENLOHE, compelled to leave Magdeburg, was on the 25th between Rathenau and Ruppin, retreating to Stettin. 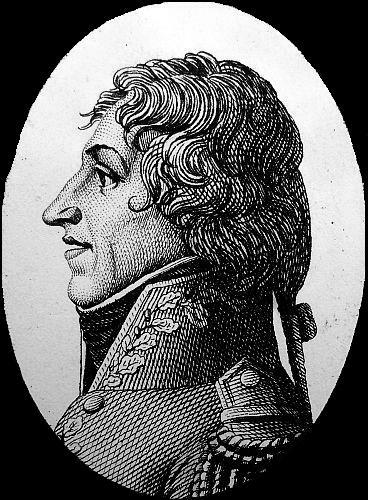 Marshal LANNES is already at Zehdenick; and it is probable that the remains of the enemy will not escape without being attacked. Prince LOUIS FERDINAND, who was killed at the opening of the campaign, was publicly nicknamed the Little Duke of ORLEANS, at Berlin. This young man abused the KING’S goodness to such a degree, that he even scandalized him. He was one who, with some other young Officers, broke the windows of Count HAUGWITZ, on the night when that Minister returned from Paris. We are at a loss to know which to admire most, the audacity or the weakness of this young man. A great part of the effects, sent away from Berlin to Magdeburg, and embarked upon the Oder, has been intercepted by the light cavalry. Upwards of sixty schuyts have been brought back loaded with cloathing, meal, and artillery. Some of the regiments of the hussars have made prizes to the amount of upwards of 500,000 francs; and it is reported that they exchange their silver and gold, with a loss of fifty percent. The palace of Charlottenburg, where the EMPEROR resides, is situated one mile from Berlin, upon the Spree. As the military movements are no longer uncertain, they are become still more interesting, by the contrivances of marches and manoeuvres. The indefatigable Grand Duke of BERG was at Zehdenick on the 26th, at three o’clock in the afternoon, with a brigade of light cavalry, under General LASALLE, while the division of dragoons under the Generals BEAUMONT and GROUCHY were marching at the same point. The brigade under General LASALLE presented itself to the enemy, who opposed it with 6,000 cavalry. This was the whole of the cavalry of the Prussian army that had escaped from Magdeburg, forming the advanced guard of Prince HOHENLOHE’S corps, directing their march towards Stettin. 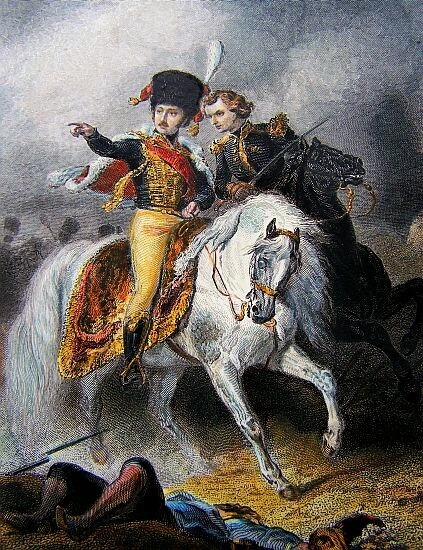 At four in the afternoon, when both divisions of the cavalry had arrived, General LASALLE attacked the enemy with his usual intrepidity, which has always formed his character of the French Hussars and Yagers in the present war. The enemy’s line, though formed three deep, was broken; they were pursued into the village of Zehdenick, and thrown into confusion in the defiles. The QUEEN’S Regiment of Dragoons endeavoured to recover themselves, but the dragoons of GROUCHY’S division soon shewed themselves, fell upon the enemy, and made dreadful havoc among them. A part of these 6,000 cavalry were driven into the marshes; 300 remained upon the field; 700 with their horses were made prisoners. The Colonel and a great number of Officers of the QUEEN’S regiment are included. The colours of the regiment are taken. Marshal LANNES’S corps is in full march to support our cavalry. The Curassiers are marching in columns to the right wing, and another corps is advancing towards Gransee. We shall be at Stettin before the army that are marching there; which being out flanked, is as good as cut off already. Undisciplined as they are, there is reason to hope that not a man of them will escape, and that the whole of that part of the Prussian army, which lost two days, without any advantage at Magdeburg, in order to collect themselves, will now be able to reach the Oder. The above mentioned affair at Zehdenick, as a martial achievement, is remarkable–neither party had any infantry–but that the Prussian cavalry is much inferior to ours, is proved by the events of this campaign. They have never been able to make a stand against half their number of French. One of the Adjunets of the General Staff taken prisoner by the enemy in Thuringia, as he was carrying orders to Marshal MORTIER, was conveyed to Custrin, where he saw the KING. He says, that very few troops had arrived on that side of the Oder either there, or at Stettin; he scarcely saw any infantry. Yesterday the EMPEROR made his public entry into the city; he was attended by the Prince of NEUFCHATEL, the Marshals DAVOUST and AUGEREAU. 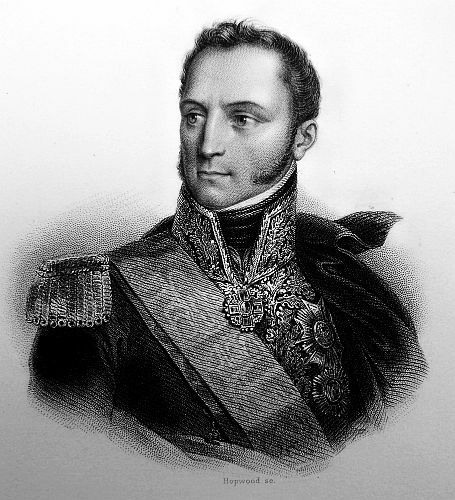 Marshal LEFEBVRE headed the train with the Imperial Foot Guards. 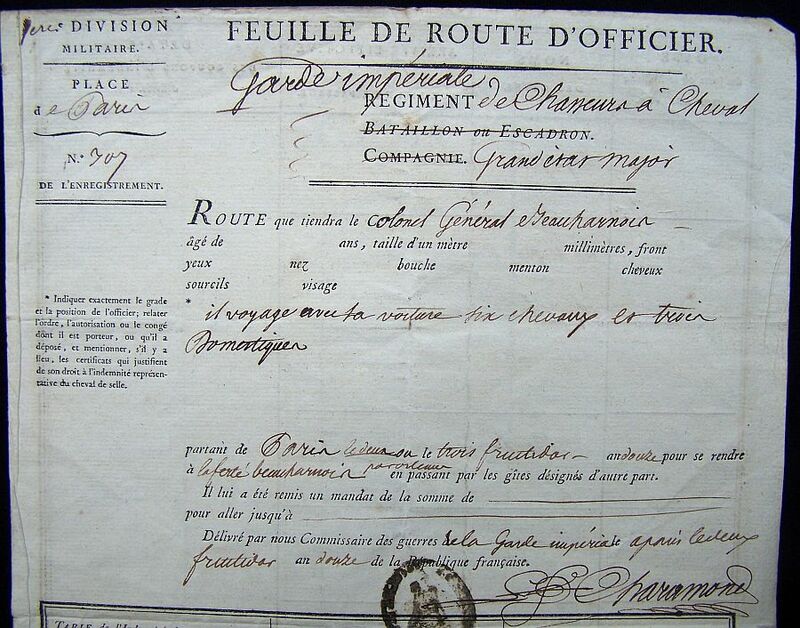 The Cuirassiers of NANSOUTY’S division were drawn up in order of battle along the road. The EMPEROR marched between the Grenadiers and Horse Yagers, belonging to his Life Guard. At three in the afternoon he alighted at the Palace, where he was received by the Grand Marshal DUROC. This day, the 28th, his MAJESTY mounted his horse to review Marshal DAVOUST’S corps. Tomorrow that under Marshal AUGEREAU will pass in review before him. 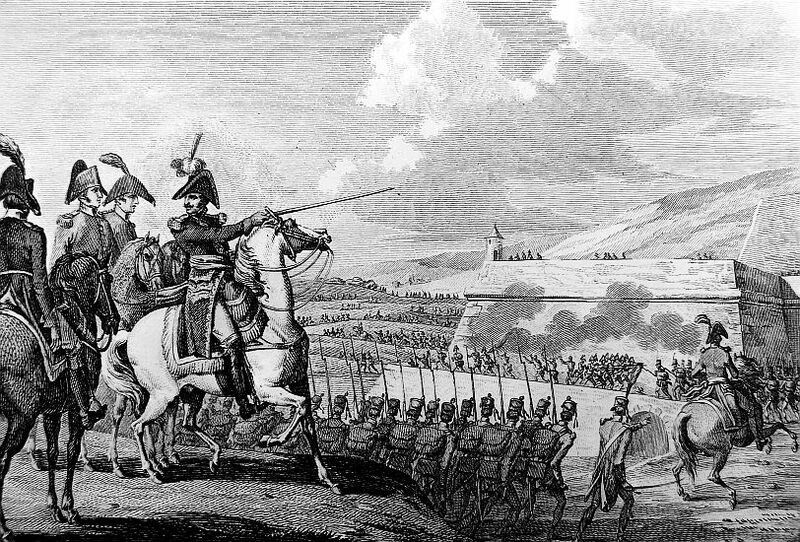 The Grand Duke of BERG, Marshal LANNES, and the Prince of PONTE-CORVO, are pursuing Prince HOHENLOHE. After the gallant affair with the cavalry at Zehdenick, the Grand Duke of BERG advanced to Templin, where he found a great quantity of provisions, and the dinners for the Prussian Generals and their troops ready dressed. At Granzee Prince HOHENLOHE changed his route, and took the road to Furstemberg. It is probable that being cut off from the Oder, he will be surrounded and made prisoner. The Duke of WIEMAR is in a similar situation with respect to Marshal SOULT. The Duke seemed to wish to cross the Elbe at Tangermunde, in order to approach the Oder. On the 25th Marshal SOULT anticipated him. 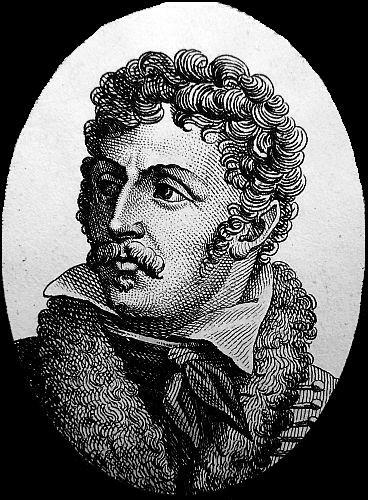 If we come up with him, not a man will escape: if he succeeds in crossing the Oder, he will fall into the hands of the Grand Duke of BERG, Marshal LANNES, and the Prince of PONTE-CORVO. A part of our troops are upon the Oder. The King of PRUSSIA has passed the Vistula. Count ZASTROW was presented to the EMPEROR on the 27th, at Charlottenberg, and delivered a letter from the King of PRUSSIA. At this moment an Aid-de-Camp from Prince EUGENE has announced a victory obtained over the Russians at Albania. [To the Bulletin a Proclamation of the EMPERORS is added, expressing his thanks to the army in general, repeating the whole of their conquests, and announcimg his intention to meet the Russians and Prussians, who are advancing; he declares , THAT HE WILL MAKE NO PEACE WITH ENGLAND TILL HE HAS DEPRIVED HER OF THE MEANS OF DISTURBING THE TRANQUILLITY OF THE CONTINENT ANY MORE. The Duke of WEIMAR passed the Elbe at Havelberg. 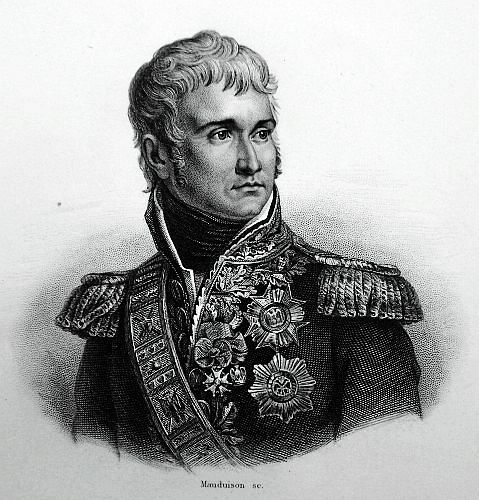 Marshal SOULT proceeded on the 29th to Rathnau, and on the 30th to Wertenhausen. On the 29th, the column of the Duke of WEIMAR was at Rhinsberg, and the Prince of PONTE-CORVO was at the same time at Furstenberg. There is no doubt that this corps, consisting of 14,000 men, have already fallen into the hands of the French army, or are at this moment in the act of surrendering. General BLUCHER also left Rhinsberg in the morning of the 29th with 7000 men, in order to proceed to Stettin, but Marshal LANNES and the Grand Duke of BERG had three days march in advance of him. This column is therefore now in our power, or will be captured within 48 hours. In the last Bulletin we mentioned that the Grand Duke of BERG, in the affair of Prentzlow, obliged the Prince of HOHENLOHE, and his 17,000 men, to lay down their arms. On the 29th, an enemy’s corps of 6,000 men likewise capitulated to General MILHAUD, at Passewalk. This gives to us 2,000 horses, with their saddles, and hangers. There are besides more that 6,000 horses which the EMPEROR has still at Spandau, after having mounted all his cavalry. Marshal SOULT having arrived at Rathnau, fell in with five squadrons of Saxon cavalry; they solicited a capitulation which was granted. This produced a farther supply of 500 horse for the army. We have taken, up to this period, 150 stand of colours, among which are some embroidered by the hands of the beautiful QUEEN herself; a beauty which has proved as disastrous to the people of Prussia, as that of Helen did to the Trojans. The States of the Duke of BRUNSWICK are taken possession of, and it is believed that the DUKE has fled to England. All his troops are disarmed. 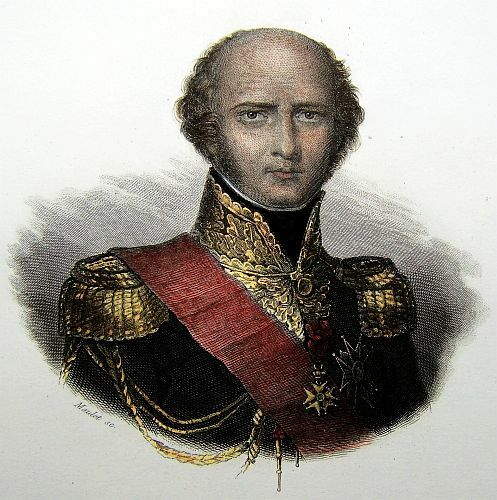 If he deserves the hatred of the French people, he has no less merited that of the Prussian state and army–of the nation, which accuses him of being one of the promoters of the war–of the army, which complains of his manoeuvres, and all his military proceedings. 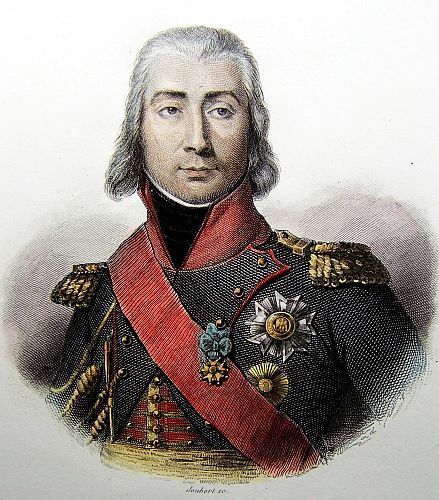 The errors in calculation of the young gendarmes are pardonable, but the conduct of this old Prince, 72 years old, is an excess of delirium and catastrophe to him would not excite any regrets. How respectable can age be if the boasting and inconsideration of youth are joined to the frailties of age? At Stettin we found a considerable quantity of English merchandise and in a warehouse on the Oder; were also found 50 pieces of cannon, and a great quantity of provisions. The 1st of November the Grand Duke of BERG was at Demmin, the 2d at Teterow, while his right lay at Rostack. General SAVARY was on the 1st at Kratzeburgh, and early on the 2d at Wharton and Jabel. 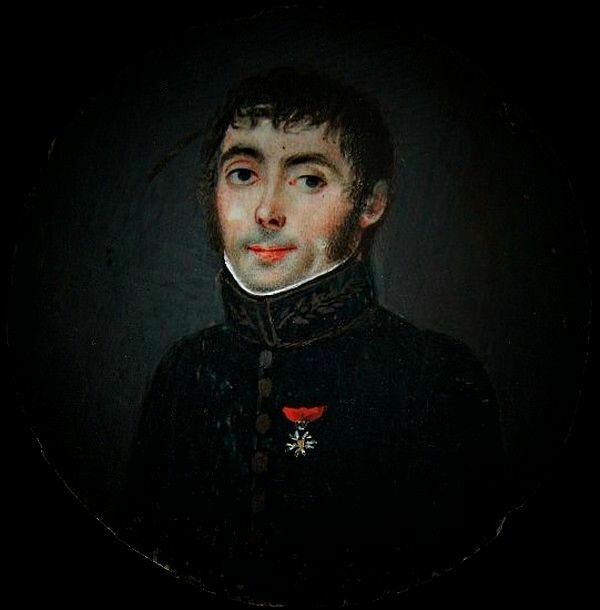 The Prince of PONTE-CORVE, on the 1st was engaged at Jabel with the rear guard of the enemy. The conflict was spirited; the Prussians were put to the rout, and would have been completely cut off that day, had not the lakes, and the difficulty of traversing the country of Mecklenburg, saved them. 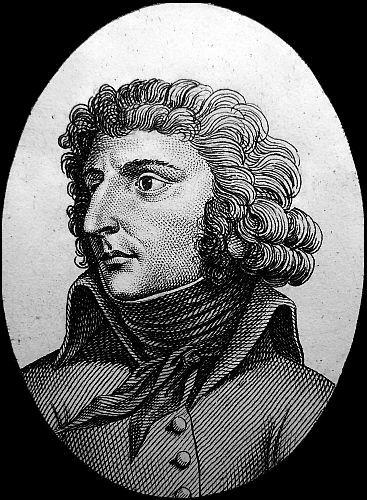 The prince of PONTE-CORVO, in charging with the cavalry, had a fall from his horse, but was not hurt. 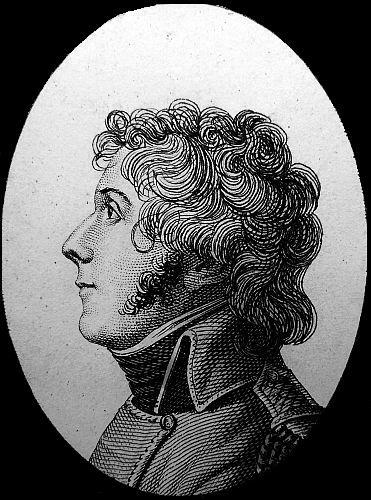 Marshal SOULT arrived on the 2d at Planer. And so the enemy finding every point of retreat intercepted–to the Oder–to the Elbe–to Swedish Pomerania, appeared of reaching the nearest coast of the Baltic: when any part of their column fell into our hands, we found them destitute even of baggage. Marshal LANNES is at Stettin; DAVOUST at Frankfort; Prince JEROME in Silesia. The Duke of WEIMER has quitted his command, in order to return to his own territories; a General very little known was his successor. 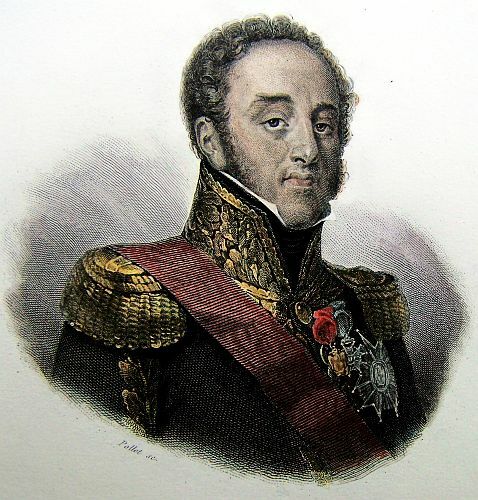 The EMPEROR this day received the division of dragoons, under the command of General BOURCIER, on the Esplanade of the Palace, and has ordered several promotions there. All the dismounted cavalry have repaired to Potsdam, where the horses taken from the enemy have been sent, in order to be mounted. General BOURCIER has the charge of this grand depot. The fortifications at Spandau, Wittemberg, Erfurt, Kustrin and Stettin, are putting in the best possible state of defence. Marshal MORTIER, who commands the 8th corps of the Grand Army, arrived at Cassel the 31st of October. The Prince of HESSE-CASSEL, Marshal in the service of Prussia, and his son, a General in the same service, have withdrawn from it. The Prince, in answer to the note which was transmitted to him, demanded permission to march at the head of his own troops, along with those of France, against our enemies. 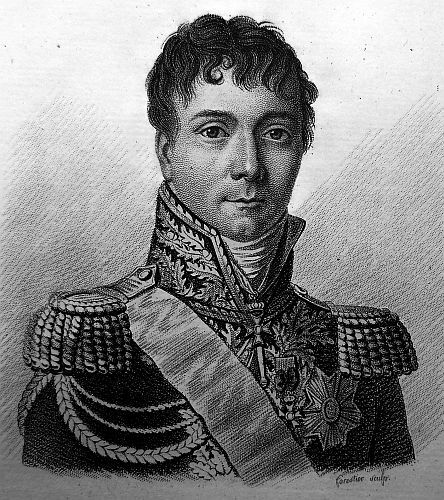 Marshal MORTIER replied, he had no orders touching such a proposition: but the Prince having armed, after the declaration he had made through his Minister, M.de MALSBOURG, at Paris, the least further armament on his part would be considered as an act of hostility, as the Prussians had not violated his territories, but on the contrary were received with pomp by the Hereditary Prince; and that from the people of the Hessian territories being evacuated by the French, after the battle of Jena there was armaments going forward at Cassel; and that, in point of fact, the Hereditary Prince was more desirous of marching at the head of the Prussian troops and to insult the French by all sorts of provocation. He will pay for his frenzied conduct by the loss of his dominions. There is not a Principality in all Germany that has been so uniformly the enemy of France. For many years its Sovereigns sold the blood of their subjects to England, in order to fight with it against France in the two worlds. By its traffic of his troops, the PRINCE in question has amassed great treasures, part of which, it is said, are shut up in Magdeburg, and a part remitted to foreign countries. This sordid avarice has caused the catastrophe of his House, the existence of which on our frontiers, is incompatible with the safety of France. It is finally time to extinguish that which may cause the unhappiness of 40 million of people, and bring trouble and disorder to their very doors. The English may yet corrupt certain Sovereigns by means of their gold, but the loss of the thrones of such Sovereigns will be the inevitable consequences of such corruption. On the contrary, the Allies of France will prosper and become larger. 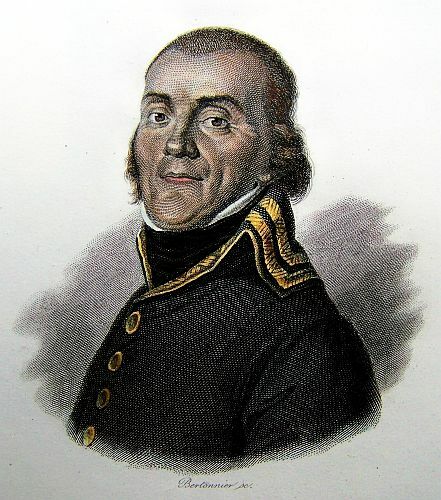 The people of Hesse-Cassel will be more fortunate; eased of the expense of vast military establishments, they can follow the peaceful of occupations of agriculture; freed from a great part of their taxes, they will be governed upon generous and by the principles, as are France and her Allies. If the French had been conquered, their country would have been dismembered, it is just, therefore, that the serious consequences of war should attach to those who provoked it. In this terrible game the chance should be equal. The EMPEROR has ordered the fortresses of Hanau and Marbourg to be destroyed, all the magazines and arsenals to be removed to Mentz–all the troops disarmed and the sovereign arms of Hesse-Cassel everywhere to be taken down. These measures are not dictated by an insatiable ambition, nor a thirst for further conquest. The Cabinet of the Tuileries is induced by its conviction of the necessity of putting an end to a contest, such as the present, and causing a durable peace to succeed to this insensate war, instigated by the miserable and low manoeuvres of Agents, such as the Lords PAGET and MORPETH. The campaign against Prussia was entirely finished by the capture of Magdeburgh, and the affair at Lubeck. 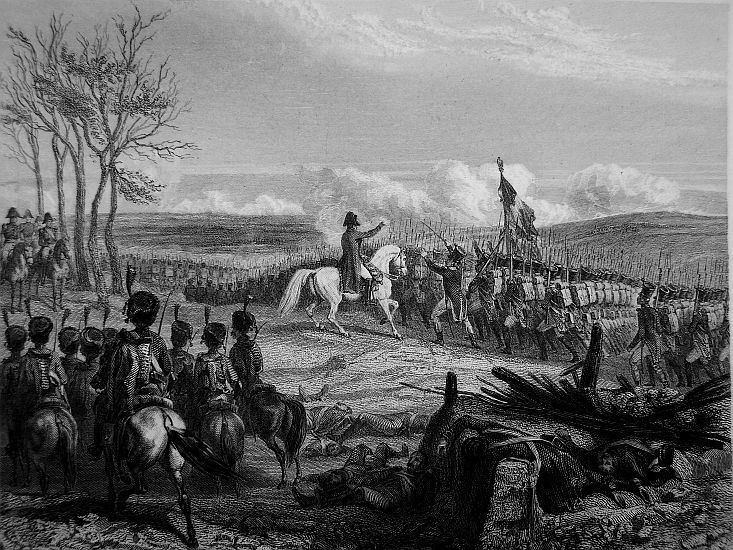 The following was the situation of the French army at the beginning of the campaign.–The corps of General RUCHEL, called the Army of Westphalia, consisted of 33 battalions of infantry, for companies of chasseurs, 45 squadrons of cavalry, a battalion of artillery, and seven batteries, exclusive of the artillery of the regiments. The corps of Prince HOHENLOHE consisted of 24 Prussian battalions, 25 Saxon battalions, 45 Prussian and 36 Saxon squadrons; two battalions of artillery, eight Prussian, and eight Saxon batteries. The army commanded by the KING in person, was composed of an advanced guard of 10 battalions and 15 squadrons, commanded by the Duke of WEIMAR, and of three divisions. The first, commanded by the Prince of ORANGE, consisted of 11 battalions and 20 squadrons. The second division, commanded by General WARTENSLEBEN, consisted of 11 battalions and 15 squadrons. The third division, commanded by General SCHMETTAU, consisted of 10 battalions and 15 squadrons. The reserve of this army, commanded by General KALKREUTH, consisted of two divisions, each of 10 battalions of guards and 20 squadrons. The reserve, commanded by Prince EUGENE of WIRTEMBERG, consisted of 18 battalions and 20 squadrons. Thus the whole of the Prussian army amounted to 160 battalions, and 236 squadrons, with 50 batteries of artillery, making a total of men under arms, 115,000 infantry, 30,000 cavalry, and 800 pieces of artillery, including the battalion guns. The whole of this army was engaged in the battle of the 14th, except the corps of the Duke of WEIMER, which was at the time at Eisenach, and the reserve under the Prince of WIRTEMBURG, making the total of the Prussian army in the battle 126,000 men. Of these 126,000 not a man has escaped. Of the corps of the Duke of WEIMAR not a man has escaped. Of the corps of the Duke of WIRTEMBURG, which was defeated at Halle, not a man has escaped. Thus these 145,000 men have all been either taken, killed, or wounded. All their colours and standards, their cannon, baggage, Generals, have been taken, and nothing has passed the Oder. The KING, the QUEEN, General KALKREUTH, and 10 or 12 Officers more, are all that have escaped. The King of PRUSSIA has at present one regiment at Gros-Glogau, where it is besieged, one at Breslau, one at Brieg, two at Warsaw, and some regiments at Konigsberg, in the whole about 15,000 infantry, and 3 or 4,000 cavalry. Some of his troops are shut up in fortresses. The KING cannot bring together at Koningsberg, where he has taken refuge, more than 8,000 men. 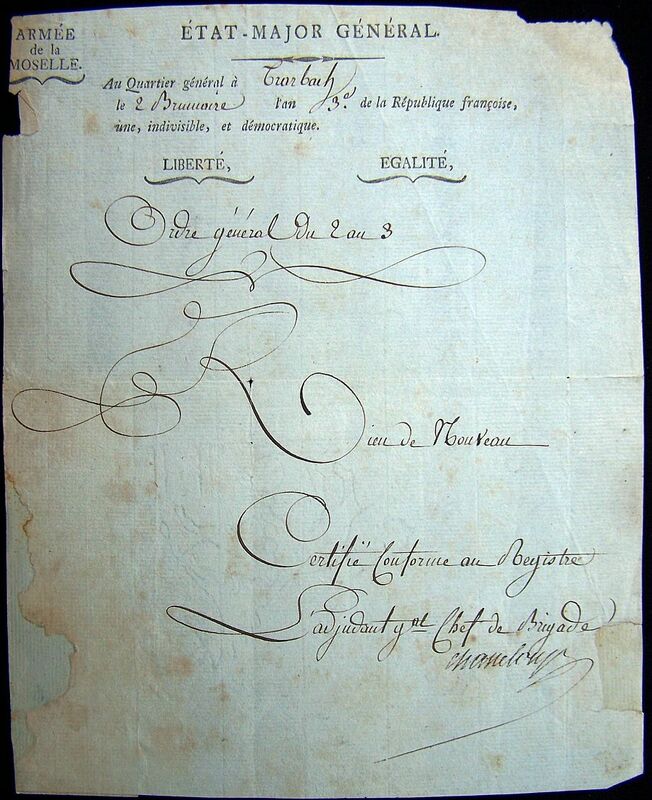 The Elector of SAXONY made a present of his picture to General LEMARROIS, the Governor of Wittemberg, who, being at Torgau, restored order in a House of Correction, among 800 robbers, who had armed for the purpose of plundering the town. Lieutenant LEBRUN presented yesterday to the EMPEROR, four standards belonging to four Prussian squadrons, commanded by General PELET, which capitulated to General DROUET, near Lanenburgh. They have escaped from General BLUCHER’S corps. 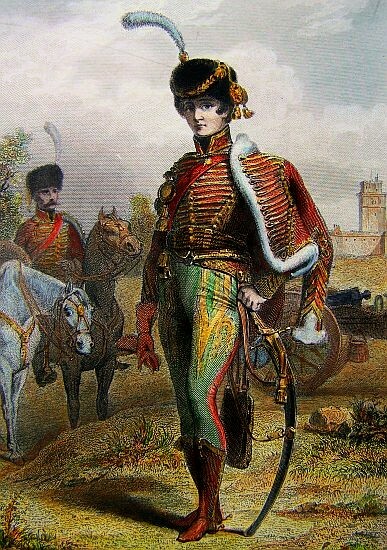 Major AMEIL, at the head of a squadron of the 16th Chasseurs, who was sent by Marshal SOULT along the Elbe, to seize what ever might have escaped from BLUCHER’S corps, took 1000 prisoners, of which 500 were Hussars, and a great quantity of baggage. The following is the position of the French armies: the division of the Cuirassiers of General HAUPOULT, the divisions of dragoons of Generals GROUCHY and SAHUC, the Ligfht Cavalry of General LASALLE, making part of the Cavalry of Reserve which the Grand Duke of BERG had at Lubeck, are on their march to Berlin. The head of the division of Marshal NEY, to which Magdeburgh surrendered, arrived this day at Berlin. The corps of Prince PONTE-CORVO and Marshal SOULT are on their march for Berlin. 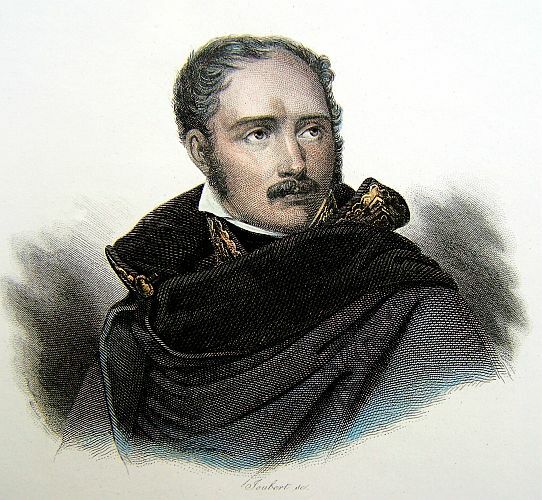 The corps of Marshal SOULT will arrive on the 20th; that of Prince PONTE-CORVO some days after. Marshal MORTIER, with the eighth corps of the army, has arrived at Hamburgh, to shut the Elbe and the Weser. General SAVARY, with the Dutch division, is entrusted with the blockade of Hameln. The corps of Marshal LANNES is at Thorn. The corps of Marshal AUGEREAU is at Bromberg, opposite Graudenz. The corps of Marshal DAVOUST marches from Posen upon Warsaw, whither the Grand Duke of BERG, with the remainder of the cavalry reserve, consisting of the divisions of dragoons of Generals BEAUMONT, KLEIN, and BEKER; of NANSOUTY’S division of cuirassiers; and of the light cavalry of General MILMAUD. Prince JEROME, with the allied corps, besieges Gros-Glogam. His battering train was taken from Custrin. One of his divisions invests Breslau. He takes possession of Silesia. Our troops occupy the fort of Lenczyc, half way between Posen and Warsaw. Some stores and artillery were found there. The Poles are well inclined, but to the Vistula the country is difficult and very sandy. The Vistula for the first time beholds the Gallic Eagle. The EMPEROR has ordered that the King of HOLLAND should return to his kingdom, to see to its defense in person. The King of HOLLAND has taken possession of Hanover, with the corps of MORTIER. The Prussian Eagles and the Electoral Arms have been both erased. The following suspension of arms was signed yesterday at Charlottenburgh. The season being advanced, this suspension establishes the quarters of the army. Part of Prussian Poland is thus occupied by the French army, and part of it is neutral. Art. I. The troops of his Majesty the King of PRUSSIA, who are now on the right bank of the Vistula, shall unite at Koningsburgh, and at Regal Prussia, on the right bank of the Vistula. Art. II. The troops of his Majesty the Emperor of the FRENCH and King of ITALY, shall occupy the part of South Prussia, which is on the right bank of the Vistula, as the mouth of the Bug, Thorn, the fortress and city of Colberg and Lensczyz, which are to be given to them as sureties; and, in Silesia, the fortified places of Glogan and Breslau, with the portion of that province which is upon the right bank of the Oder, and that part situated on the left bank, which is bounded by a line drawn from the river, five leages above Breslau, passing by Ohlan and Zobsen, and three leagues behind Schweidnitz, without however including that fortification, and from thence to Freyburgh, Landshut, and joining Bohemia at Liebau. Art. III. The other parts of Eastern Prussia, or of Eastern New Prussia, shall not be occupied by any armies, whether French, Prussian, or Russian; and if Russian troops shall be there, his PRUSSIAN MAJESTY engages to make them retire to their own territory, as also not to receive any troops belonging to that Power into his States during the time that the present suspension of arms shall exist. Art. IV. The fortified places of Hameln and Nieuburgh, as well as those set forth in the second article, shall be surrendered to the French troops, with all their warlike stores and ammunition, of which an inventory shall be made within the eight days succeeding the exchange of the ratifications of the present suspension of arms. The garrisons of those places shall not be prisoners of war: they shall be marched to Koningsburgh, and all the necessary facilities shall be given for that purpose. Art. V. The negotiations shall be continued at Charlottenburgh, and if peace should not result from them, the two High Contracting Parties engage not to recommence hostilities without reciprocally giving ten days notice. Art. VI. The present suspension of arms shall be ratified by the two High Contracting Powers, and the exchange of the ratifications shall take place at Graudentz, the 21st of the present month, at the latest. In faith of which, the undersigned Plenipotentiaries have signed the present, and affixed their respective seals. Done at Charlottenburgh, the 16th of November, 1806.